Today, let's take another look at milk as it relates to kids and schools. Unfortunately, schools aren't likely to adopt raw milk in the near future. There is just too much hype and fear about it. Okay, that is a battle for another day, but what about the milk that is offered and is promoted. What can we do about it? For one, we can make it organic and try to find the best sources for it as possible, i.e. healthy cows fed grass. On Eat Wild there is a list of 100-Percent Grass-fed Dairies by state. It would also do a world of good to support these smaller dairies and local sources! Second, perhaps we can get the stuffing out of our government and policy maker's ears about fat. Guess what? 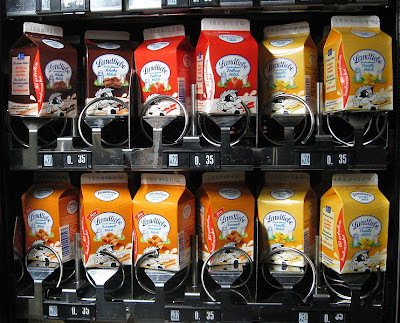 Low-fat milk isn't saving kids from obesity. In fact, the added sugar is making the problem worse. Kids need fat and saturated fat is healthy. Scared of increasing triglycerides that correlate with heart disease? Stop eating all that carbohydrate because that's what's contributing to high triglycerides, NOT the saturated fat. Not convinced? Read the whole story at Mark's Daily Apple's Definitive Guide to Saturated Fat. So let the kids drink WHOLE MILK. Fourth, we can fight the flavored milk campaigners who think that kids won't drink milk unless it is "flavored," otherwise known as "sugared." Yes, believe it or not, there is a campaign to keep chocolate milk in school. This dairy industry-funded campaign, Raise Your Hand for Chocolate Milk, includes advertisements, petitions, and activism to raise public support. The campaign could cost them between $500,000 to $1 million, according to their marketing group. Unfortunately, the funds they are using come from commodity producers through a USDA-administered program. Will kids still drink milk if it's plain? Yes! Despite the doomsday studies sponsored by the dairy industry, kids will still drink milk. It will take them some time to adjust, and sales will drop, but perhaps that is a good thing. Kids might actually start drinking more water and have more appetite for healthy meals if we supplied them in schools. Imagine that! Why are they pushing so hard for flavored milk? If they were trying to get kids healthier, wouldn't they try to promote the unflavored milk? Here is where Big Corn comes in with the money, power, and surplus. Guess what sweetener is most common in chocolate milk? High fructose corn syrup? Bingo! Unless you live in a cave, you've probably heard how HFCS is looking worse and worse, held responsible for metabolic syndrome nasties like increasing obesity, diabetes, heart disease, and non-alcoholic fatty liver disease, to just name a few. Did you know that flavored milk has the same sugar as a soda? Read this post from Consume This First and another from Chef Ann, the Renegade Lunch Lady, who is making strides revolutionizing school lunches (see more below). Doesn't it seem a little contradictory to decry soda, when flavored milk and juice both have the same amount (if not more) of sugar? Do they really think the vitamins and minerals can overbalance the destruction (and addiction) caused by the sugar? The funny thing is that you can get your vitamins and minerals from real food without the sugar. And real food trumps that which is engineered and processed any day. Still think the sugar isn't a big deal? According to USDA guidelines (which are horrendous, but standards nonetheless), only 10% or less of total calories should come from added sugars. Just taking the added 4 teaspoons of sugar in one 8oz container of flavored milk, that's nearly half the sugar allowed in a day for children up to 9 years old. Just think of all the other sources of added sugar in a child's day: cereal, snacks, other flavored drinks, juice, processed foods, etc. Even on a supposedly junk food- and soda-free diet, most kids are getting WAY too much sugar! It is no wonder that on average we are consuming twice our allotment of sugar a day! Think I am crazy? Try taking an inventory of sugar in a child's foods for one day. If you aren't reading labels, you should be! Who Is Making A Difference? Chef, author, and nutritional advocate Jamie Oliver is attacking the flavored milk in our schools with his campaign for school lunch reform. His passion and astounding presentation will make you emotional. Seriously. There is another TED speaker: Renegade Lunch Lady, Chef Ann Cooper. Chef Ann has been a vocal proponent for school lunch reform, including the removal of flavored milk from her school districts. She has dubbed flavored milk "soda in drag." Her TED speech sounds remarkably similar to Jamie Oliver's. Really makes you disgusted with school lunches and ready to take action, doesn't it? With the help of prominent supporters like Oliver and Cooper pushing school lunch reform, some schools are saying enough is enough. Think kids won't drink milk unless it is flavored? Think again. Berkley, California, and Boulder, Colorado, took flavored milk off the menu in their school districts under the leadership of Chef Ann Cooper. Washington DC has banned the sale of flavored milk in their public schools and others may soon follow. The Florida School Board is contemplating the change too. 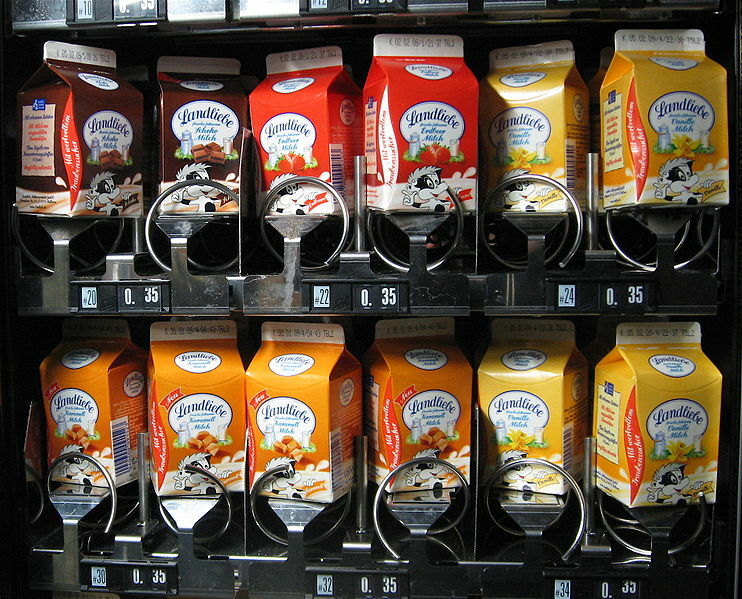 Others school districts like those in Connecticut have put restrictions on the amount of sugar allowed in flavored milk. While this is a step in the right direction, the allowed sugar is still too high. From that link, just look at TruMoo 1% chocolate milk from Garelick Farms, which has 31g of sugar in 8oz of milk. That's the same as Rockstar Energy Drink or Mountain Dew! Other school districts like those of Barrington, Illinois restrict the days flavored milk can be served by having "Flavored milk Fridays." For another summary on the recent debate, check out this recent (Sept. 2010) New York Times article: A School Fight Over Chocolate Milk. Bottom line: If you are going to let kids drink milk, go full-fat, organic, grass-fed, and raw if at all possible. Sugar does NOT need to be added to everything a child eats and drinks! Keep reading for more debunking of other popular drinks! Next time let's talk chocolate milk and sports recovery. Next segment: What To Drink Part 5: Chocolate Milk for Recovery? Can you think of a more delicious sounding veggie? Imagine bacony decadence coupled with crisp-tender, sweet broccolini that's ready in 15min or less. Is your mouth watering yet? Let's take a brief interlude on the What To Drink series of posts to go back to my roots and post a recipe. I know, I know, it's been awhile. Why? I have been trying out some N=1 experiments (more on those later) and cheating intermittently while vacationing and entertaining out of town guests. That is life and now more than ever I can definitely understand why food is a drug. It can benefit your entire being when it's on, and carry one hell of a punch when it's not. When I am normally so dialed in, faltering is felt. Big time. And I am not just talking about nausea/stomach ailments or loss of energy after carb-heavy meals. I am talking about outright depression. Food is a drug, for good or for worse. So when I am dialed in, what is life like? I have made it as simple as possible so it is easy to follow. I don't have to plan or put in much effort at all. When I am on the diet, I am really just eating meat and vegetables. I am trying the low-carb thing, so I'm choosing low-carbohydrate vegetables instead of fruit and starches. You would think the reduction in possibilities makes like harder, but it's actually just the opposite. With too many choices, I'm overwhelmed and don't always make the best choices. With fewer, I can focus more on the food itself and find myself sticking to newfound favorite staples that aren't much fuss at all. There's hardly a "recipe" to speak of. Life can't be simpler. Or more delicious! Seriously, I crave this fuel for the taste, satisfaction, high energy, and high spirits that follow. Pick a meat (like poultry, pork, beef, or fish) and choose a cut you have on hand or buy it from the store (remember to focus on grass-fed/pasture-raised/wild-caught/organic meats). Pick a veggie. For ease, make it a quick-cooking (like a broiler/grill crisp-able) or no-cook veggie (like salad, assorted vegetable sticks, or carrots). Prepare the meat and quick-cooking veggie the old fashioned way by grill, broiler, or hot pan with little more than salt, pepper, and sometimes a cooking fat if needed/desired. Add a fat like bacon or guacamole/avocado if you didn't use plenty of cooking fat. So it boils down to: meat, vegetable, and fat. That is ALL I have to think about to have a meal. Simple. And I can taste and enjoy every single component because I'm keeping it simple. Naked so to speak. I can also use this strategy to buy already cooked components from the grocery store, like mackerel canned in olive oil tossed over packaged salad greens with the juice of half a lemon or a splash of vinegar (here's the basic recipe: Salad from the Sea--scroll down to the bottom to find it). Simple and satisfying! Lunches are even easier using precooked roasted turkey breast or leftovers from dinners (always make more than you need!) and cut veggies or a salad. Add some nuts, avocado/guacamole, cooking fat, bacon, or skin for some fat. Breakfasts are the staple of which I NEVER tire: farm fresh eggs and chicken-apple sausage cooked in raw, grass-fed butter or bacon fat, and perhaps a green veggie to wilt in the pan like spinach. Pretty simple! Just make sure you have plenty of meat, plenty of veggie, and plenty of healthy fat (monounsaturated and saturated). Thinking of your meals in terms of just these three things makes life SO much easier! Cooking is no longer a chore and neither is meal planning! Broccolini is sweet broccoli. It has thin, slender stems still attached to the small florets. The sweetest and most tender are those with the thinnest stalks, as opposed to those with thicker, woodier stems. Broccolini isn't really baby broccoli, as I once thought; instead, it's a cross between Chinese broccoli and regular broccoli. Surprisingly, this new variety was just introduced in the US in 1998! Broccolini is definitely kid-friendly since it is a finger food (even when cooked) and naturally sweeter than regular broccoli. Like most veggies, it's most nutritious when raw and only needs quick cooking. It's rich in vitamins A and C as well as fiber, potassium, and iron. I imagine many of the benefits of standard broccoli still apply. See more at The World's Healthiest Foods. According to the Linus Pauling Institute at Oregon State University, cruciferous or Brassica vegetables include broccoli, cabbage, cauliflower, asparagus, Brussels sprouts, kale, bok choy, radishes, arugula and some other greens. There are some promising links between eating these veggies and preventing cancer. While high intake seems protective of cancer, make sure you aren't iodine deficient. There is a possibility of hypothyroidism if you eat a lot of cruciferous vegetables and you are iodine deficient. Find out more about iodine deficiency at this information page also from the Linus Pauling Institute. Okay, enough with how good the damned veggie is! I mean, it's a vegetable, so it's nutritiousness is a no-brainer, right? All the porky deliciousness of bacon plus good-for-you, sweet, crisp-tender broccolini? Need I say more? This is so simple it is hardly even a recipe. Let's see how few breaths it takes to recite: Take broccolini, cut off end of stems, rinse, shake to dry, place on broiler-resistant baking sheet (like stainless steel--NOT non-stick unless you like the high-heat-released toxins), drizzle on the cooled, liquid bacon fat or lather on the solid-yet-soft bacon fat (there is no such thing as "too much"), salt, pepper, arrange with thickest stems placed in the middle of the sheet, and whack in the broiler (I use the LOW setting and the top rack) for 3-5 minutes. Check for a color change to a more bright, emerald green. If your broccolini were especially slender, they might be done right now. Make sure you don't let them get floppy (unless you like them overcooked). If you want more cooking, flip them, put them back in, and wait 3-5 more minutes (varies broiler to broiler), then test for desired doneness. I like mine still very crisp, but not hard-crunchable. The stalks shouldn't be floppy, but should still yield when you try to cut them. Remove from that hot sheet once done, serve hot or at room temperature (cold is a little weird with the solidified fat clinging to them), and sop up leftover bacon fat with the florets. Um... yum! NOTE: since the broiler and grill are roughly equivalent, you could probably quickly grill these using the same recipe (but beware of fat flare-ups). Perhaps you want to dry cook them and then drizzle on the melted bacon fat after. Yum! Also, these last a few days when sealed and placed in the refrigerator. I just reheat them briefly if desired and they still remain crisp and delicious. So make more and have some leftovers for more easy meals! Now you have more tools in your nutritional toolbox to revolutionize your diet too! Let me know how it goes! Milk churns awaiting collection near to Chastleton, Oxfordshire, Great Britain. © Copyright David Luther Thomas and licensed for reuse under this Creative Commons License. This is our fifth installment in the What To Drink series and the deluge is not stopping anytime soon! In my last post, we discussed how you can be healthy with raw milk (NOT to be confused with that pasteurized, homogenized, dead bacteria and detrimental bacteria infested, watery, white liquid even if it's organic). Raw milk brings up a lot of questions. Most notably: Is it safe? The dairy industry wants you to believe that it isn't, but don't forget they have an agenda to keep themselves in business. They don't want to and probably financially can't substitute their feed grains for grass to raise healthy cows that produce healthy raw milk. Instead, you get unhealthy cows and milk that has to be processed to be safe, if even then. According to raw milk producer Organic Pastures, that's what started milk pasteurization in the first place. People were getting sick off of unclean milk from unhealthy cows. It was either clean up the processing and distribution or clean up the cows and dairy industry. And, unfortunately, we know which road they chose to take. But Isn't Raw Milk Dangerous? It is possible, but highly unlikely, that pathogens may be transmitted in raw milk just as they may be transmitted in all other foods. OPDC has demonstrated that even when high levels of pathogens were introduced into raw milk, they die off and do not grow (BSK tests). In fact, pathogen killing safety systems are hard at work, keeping raw milk safe even if it has been contaminated. OPDC products are highly pathogen resistant. For more on the safety of raw milk, read this article at Raw-Milk-Facts and another written by Organic Pastures founder Mark McAfee at A Campaign for Real Milk sponsored by the Weston A. Price Foundation. Need a nice graphic to put all this together? Here is Organic Pastures's colorful chart comparing conventional, organic, and certified raw products and practices. All I can say is WOW. Despite these arguments, Real Raw Milk Facts offers a counterpoint. Statistics from the CDC and State Health Departments comparing raw and pasteurized dairy products linked to reported foodborne disease outbreaks (1973-2006) show that raw milk and Mexican-style queso fresco soft cheeses (usually made from raw milk) caused almost 70% of the reported outbreaks even though only 1-3% of the population consumes raw dairy products. If raw and pasteurized milk were equally risky, it would be expected that there would be far more pasteurized outbreaks since the number of people drinking conventional milk is so much higher. Is it just me or does it scare you a little that over 30% of reported outbreaks come from pasteurized milk? It scares me even more than the raw milk figures. Why? Because I thought pastueization allowed me to trust their santized product. Guess not. Whereas the raw milk dangers are a common sense "duh." I am sure there are plenty of behind-the-counter exchanges of not-so-kosher raw milk because it is freakin' illegal in most states to sell it. There's NO chance of federal regulation and quality standards if it is illegal! Luckily in California I can drink raw milk when I want to. And since it is legal, it is highly regulated and I can trust it more than I can ever trust pasteurized milk. Why? Raw milk producers have their reputation on the line and don't dare add ammunition for the "ban raw milk" lobbyists. It has been estimated that about 70% of the strength of a healthy immune system is made up of the diversity of living bacteria found in the intestines. Bottom line: Don't drink milk you can't trust. Never use milk from a sick cow. Never let anything dirty get into the milk. Keep the cows on the pasture so they could eat the living grass and plants. You also want to make sure the milk is intended to be consumed raw, which is a completely different product than raw milk intended to be pasteurized. The milk intended to be pasteurized is likely from cows fed an unhealthy diet of grains and pumped full of antibiotics to keep them alive. 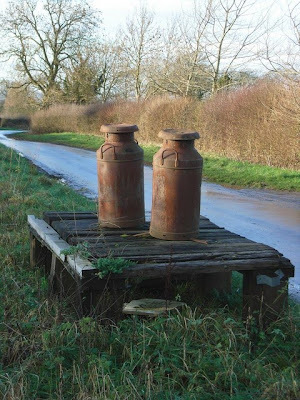 It's no wonder people get sick from drinking raw milk from those cows! Unfortunately, the clout of the mega-corp dairy producers keeps independent raw dairy producers struggling to gain a foothold. Raids are quite common in states where the sale of raw milk is illegal, which is the majority of US states. Why is it illegal? Raw milk is a threat to the dairy industry. It would take an astronomical amount of money for the dairy industry to feed and care for their cattle in a humane way that led to nutritious milk. So they have no choice but to pasteurize their contaminated product and try their damnedest to quell the excitement over their competitor: raw milk. Keep reading the series for more on the flavored milk controversy in schools and for more on other popular beverages!